We are in the midst of January and I wonder how you are faring with your new year’s resolutions? One of my resolutions is to eat more veggies, and I have consciously been trying to limit my meat intake. Which is why I found myself heading into Nottingham to try the new vegan menu at Revolución de Cuba one blistering cold Saturday morning. 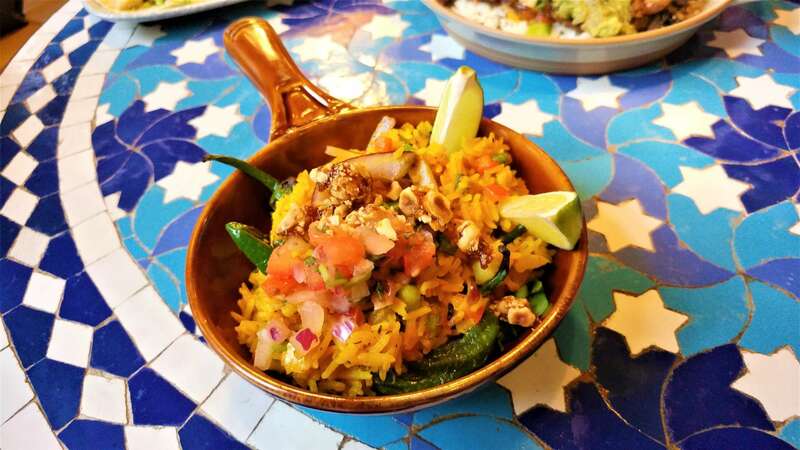 I have reviewed Revolución de Cuba, affectionately known as Rev de Cuba (or RDC if you want to get really street) before, but never eaten from the vegan menu. Would the new vegan menu sufficiently sate my appetite, or leave me a cranky carnivore? 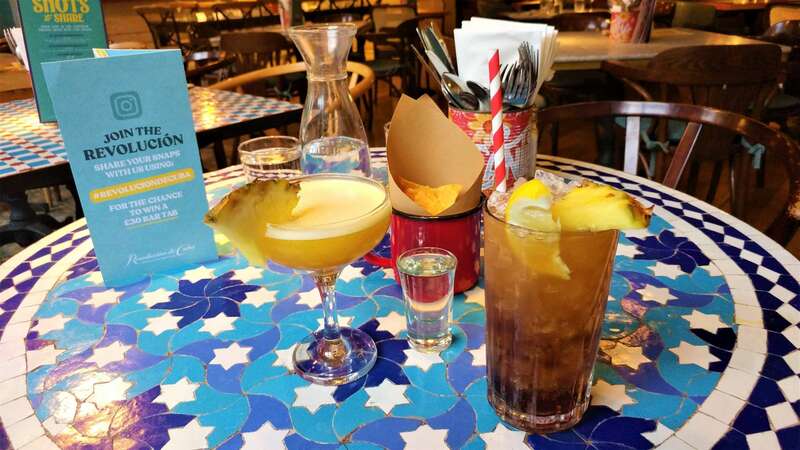 Situated in the heart of Nottingham, Revolución de Cuba is fantastically easy to get to. Yes you can drive there and parking is available around the corner. Catching the bus is perfectly fine too, and the WiFi enabled Red Arrow makes light of the 25 minute bus ride from Derby to Nottingham. It is exactly one minute after alighting at the Upper Parliament bus stop that I find myself at the candle-lit entrance of Revolución de Cuba. Ushered to our table by the politest of front of house, we are soon looking at our vegan menus. It is a good menu. From Spanish olive pinchos (small snacks) and roasted vegetable tapas to avocado brunch, there is seemingly something for everyone (bar carnivores). As it’s a midday booking, we dive straight into mains. I order three tapas dishes that make up a main. Arroz con Padrón (rice, spinach, Padrón peppers, hazelnuts) is delicious. I sink my teeth into fat, juicy Padrón peppers, some are bitter, some hot and I love it. I get a hint of garlic in the rice too, and I hastily chow down the rice, spinach and pepper combination with gusto. My second tapas of beet and avocado taco has me intrigued. Would the beetroot be served in all its purpley potent glory? It is in actual fact a meaty hash, whereby the beetroot has been ground with coriander and mint. I especially like the innovative addition of white bean purée. It is fragrant, filling, bursting with flavour, and the soft corn tortillas are a joy to eat. My third tapas of sautéed tofu with romesco is another barrier-pushing dish. Blank canvas ingredients (diplomatic speak for bland) such as tofu, courgette and aubergine should be celebrated as a challenge to be inventive with spices and flavours. Here, the smokiness of the paprika permeates the fleshy tofu, whilst the slightly tangy romesco sauce clinging to tofu chunks renders the tofu to be incredibly tasty. I especially like the addition of chargrilled brussel sprouts, which are delightfully al dente and which I crunch my way through with unrestrained glee. Dining partner chooses Bean Feast Burrito Bowl. I am seeing the humble bowl being celebrated as a character in its own right. Did you know, that the ‘BowlFood’ hashtag currently has over 45,000 posts on Instagram? The bowl food fad began way before the Harry and Meghan wedding, who served on-trend bowl food at their wedding. Bowl food lies in the in-between size of starter and main. It is favoured amongst caterers as it allows diners to eat and freely mingle, dispelling any awkward greasy finger wiping that may ensue when attempting to eat any other finger-food. I have wrapped my head around the concept of bowl food (I’ll be honest, I thought it was a little gimmicky at first), and now I think it is neat (pun intended). Anything that keeps my fingers dry, has to be a clear advantage. 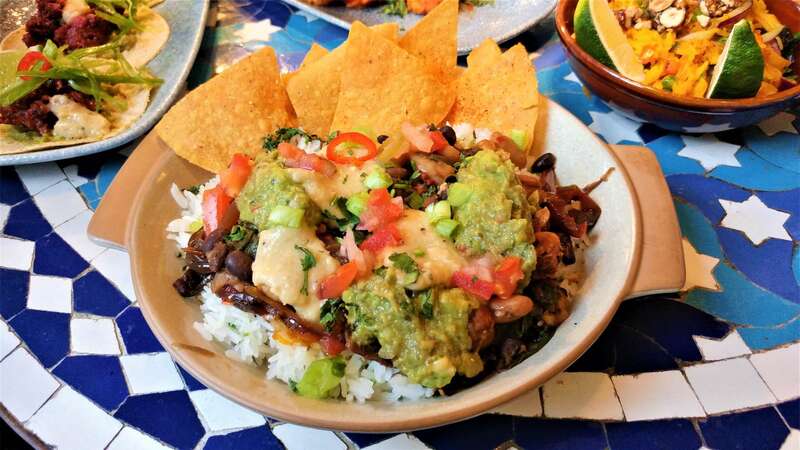 Back to the review, and Revolución de Cuba’s burrito bowl is probably my favourite dish on the table. Rice with a squeeze of lime gives it a zesty lift, whilst black beans, peppers and cannellini beans laden with guacamole make it a hearty dish which leaves you pleasantly full. We shared a dessert of coconut and raspberry bake, which was fruity and altogether scrumptious. The texture was akin to shortcake, and I was especially partial to the prosecco laced sorbet. Vegan dining at Revolución de Cuba Nottingham is excellent. 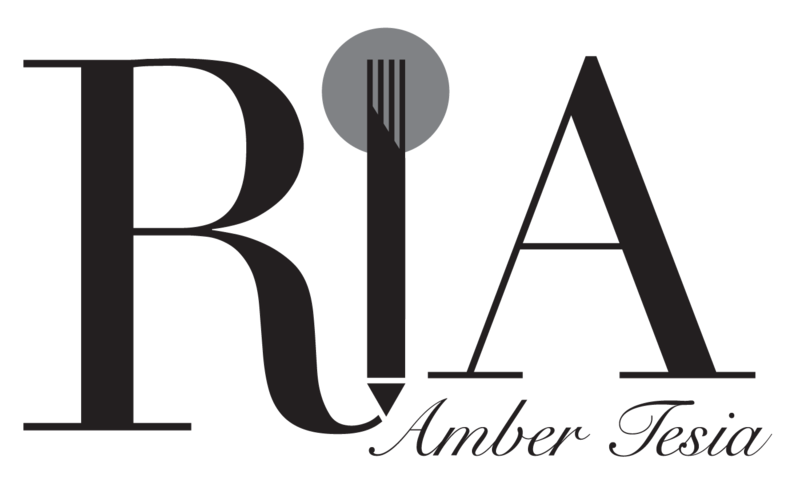 There is a real understanding of ingredients, and the chefs execute the dishes with flair. 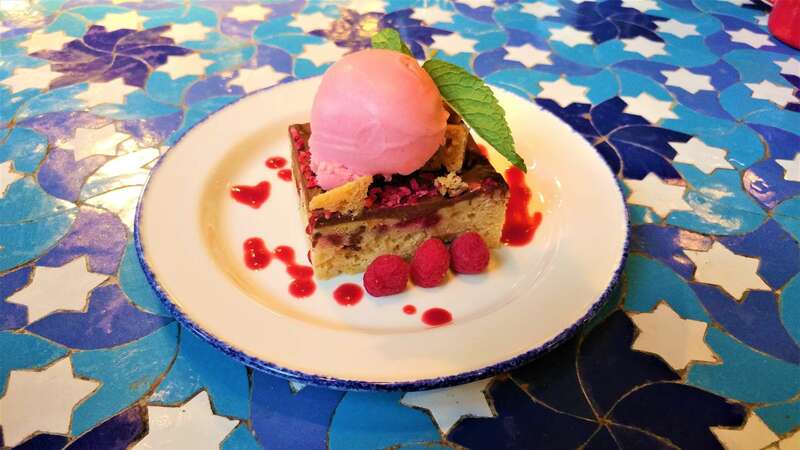 There is some serious vegan-based conversation going on behind the scenes at Rev de Cuba HQ that makes you sit up and take notice, that they mean business. From vegan food done right (it honestly doesn’t make me miss meat), to stellar service in the form of the lovely and attentive Angie (I was cold and she promptly turned up the heating for me), make Revolución de Cuba a place to visit during Veganuary and beyond. Base of tangy passion fruit and sweet pineapple married well with zesty flavours of the tapas dishes, especially the beet taco. Accents of lime and the sweet hit of Appleton Estate rum was the perfect partner to black bean and guacamole combination. Caters for dietary requirements: Yes; the menu is versatile and the handy online dietary filter makes planning a meal easy as pie. How to make reservation: Contacting one of the sales team on 0115 8715735 or online. How to get there: From Derby, board the Red Arrow bus and alight at Upper Parliament Street. Market Street is easily accessible by bus and tram within Nottingham. Whilst in the area: Duck into Oxfam across the road and peruse the book section. Their cookbook range in particular is a delightful mix of old school Delia and avant garde French tomes.